I had a very stressful year in 2008 for many reasons and we decided we deserved a break. As is was my fellas birthday he picked to go back to Baltimore. The weather was beautiful and, as always we ate and shopped and went to many museums. My two favourite days out this time round were to Hampden and Washington, they couldnt be more different than each other if they tried. Hampden is a wonderful place, I really love it there, it is a small area of Baltimore which really shows off the place to its full kitschyness. There are great little independent shops and amazing food places. Two of my favourite shops just happen to be right next to each other at the end of the main street. Doubledutch is a fab boutique which sells a mix of great lables and handmade items. I bought a coat last time I was there and enquired about selling laurafallulah items there, cut the chase they now stock my new sling bags, zip purses, large rose brooches and leaf brooches. Other than being completely biast I would really reccomend a trip there if you are in the area. Next door is Atomic Books, bringing out the geek in me, a great book shop which stocks alternative literature such as graphic novels, zines and other types of info books on music and craft plus so much more. They also sell a great range of toys and cute homeware. 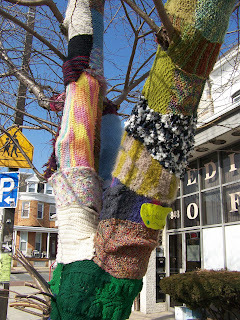 The pick above is of a 'knitted tree' outside a cute yarn shop which is just along the road. This time round we had a extra day so decided to go to Washington for the day. This was my first time here and I thought it was such a beautiful city. We spent most of the time in the museums as it was so windy that we could hardly walk outside. The path up to the white house was closed off by the police so I was a bit dissapointed as I like a bit of the touristy stuff. We snuck round the back though were there was no one around and I managed to take this snap. 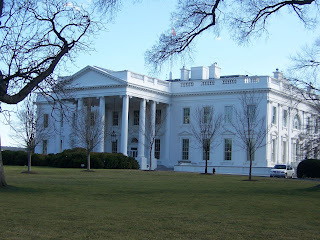 The back door was open so I said hello to Obama but I dont think he heard me. Anyway we are back now and back to the grind stone. I have lots of sewing to do and also unpacking our whole flat now the work has finished. No rest for the wicked hey! So this is where you've been! Glad you had a great time :) Baltimore sounds really interesting! And how nice of you to say hello to Obama lol.I'd like to think he heard you.